Marie Clementine Dusabejambo, a young filmmaker from Rwanda has great hopes for the future of Rwandan cinema. She talks to us about her passion for filmmaking. Marie Clementine, first tell us a bit about yourself. 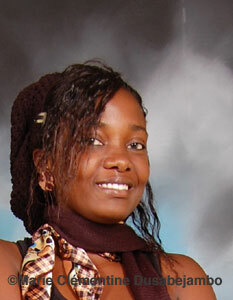 I am Marie Clementine Dusabejambo, electronics and telecommunications engineer from Rwanda. I am 24 years old and a filmmaker by profession where I work with Rwandan-based Almond Tree Films. I notice that there is a real transformation in cinema in Rwanda, which is in the process of affirming itself. What was your experience with the moving image while growing up? When we were children we saw only foreign films, especially American or even Chinese films. But later even the neighboring countries such as Congo, Uganda among others, began to make their own films, which influenced Rwandan cinema. But I would say that cinema in Rwanda actually developed after the 1994 genocide when people began to write about their experiences regarding this period. You are also an electronics and telecommunications engineer, how did you evolve into cinema? While doing my studies, I was also involved in filmmaking. In fact, I acquired my knowledge of cinema on location while working on various film shoots, and I gained quite a bit of experience since I started four years ago. Your first film, Lyiza recounts the story of a young student who discovers that the parents of one of his classmates were responsible for his family’s murder. Is the objective of the cinema of your generation of Rwandans to reconcile and rediscover an identity through filmmaking? I would not say that this generation of Rwandans attempts to find its identity through cinema, but rather that the films act as a vehicle for this identity. Cinema is a profession for us; and sometimes, a means for others to relax. The transition from French to English, what role will it play? In artistic terms, I do not think that it has changed things because in art there is a freedom linguistically speaking. What contribution would you like to make towards the growth of cinema in Rwanda? I would like for filmmaking to be a profession that is first of all accessible. I will make more films and eventually create a school to train others in cinema production. There are a lot of people who have the talent for filmmaking but who do not know how to develop it. My role is to make people aware, especially women, that as any other profession, women can make films. And that it is an incredibly remarkable experience that allows women to transmit their ideas and to better express themselves. Interview with Marie Clementine Dusabejambo and translation from French by Beti Ellerson, January 2012.